The newer Max costs twice as much as the standard Instant Pot—but which multi-cooker fares better in CR's tests? Following its December 2013 release, the Instant Pot Duo60 7-in-1 multi-cooker became an internet sensation and an Amazon best seller, inspiring cookbook authors—not to mention millions of home cooks—along the way. It remains the company’s top seller. But the Instant Pot brand continues to expand, and now includes 21 models—one of which is WiFi-enabled—and even a blender, the Instant Pot Ace Multi-Use. 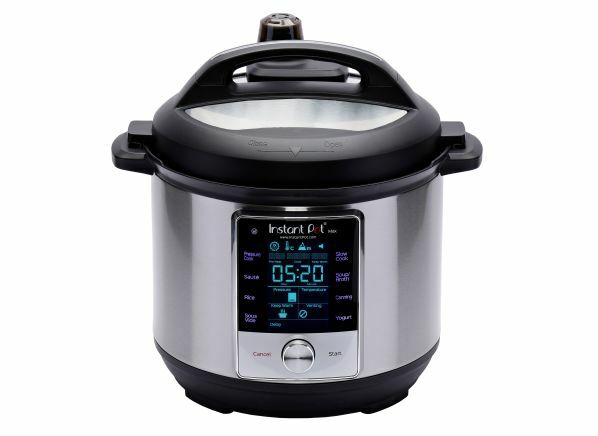 We recently put eight multi-cookers from a number of brands through their paces, including the Instant Pot Duo60 7-in-1, $100, and the Instant Pot Max, $200. Both are electric pressure cookers with dedicated functions for slow cooking, making rice, steaming, sautéing, making yogurt, and keeping food warm. We tested all of these functions, plus some additional features that set the Max apart. At the core of these little appliances’ promise? Time-saving pressure cooking. And both models deliver. “Getting dinner to the table faster is why you buy an Instant Pot, and both models earn an Excellent rating in pressure-cook mode,” says Ginny Lui, CR’s test engineer for countertop cooking appliances. For three months, testers cooked one food after another in the multi-cookers. We pressure-cooked pork ribs and beef chili with dried beans, cooked white rice, steamed a hard-vegetable medley of broccoli and carrots, slow-cooked chili and beef stew, sautéed sliced onions, and more. For each test, staffers sampled the dish and noted their judgment of the food’s taste and tenderness. We also evaluated convenience factors—the clarity of the touch controls, for example, and how easy it is to program each multi-cooker—and we assessed the durability of the coating on the interior pots. Both are 6-quart models with a round interior pot that’s made of uncoated stainless. Both models have a one-year warranty. The 1,100-watt Instant Pot Max boasts 100 more watts than the Duo. But more importantly, the Max cranks up the pressure, the options—and the price. The two multi-cookers performed similarly when we tested each of the cooking functions, earning the same rating in every case. But we found some slight differences in performance. Here’s a closer look. The Max increases the pressure to 15 psi (pounds per square inch) vs. the Duo’s 11.6 psi, meaning you can save a little more time using the Max set to its maximum pressure level. Both cookers served up tender ribs in 60 minutes when set to high pressure. Using the Max on its maximum pressure, our ribs were done in about 50 minutes (for comparison, ribs took 2 hours in our oven). When our testers made chili, using dried beans, it finished in about 70 minutes in both the Max and Duo (beans alone normally take at least 2 hours on the stove—after an overnight soak). And we saved about 10 minutes by using the Max on its highest pressure level. Carnivores, take note: You’ll save more time cooking certain foods like meat or beans with pressure, but not as much cooking rice, for example, or vegetables. Both models earn a middle-of-the-road Good rating in slow cooking. 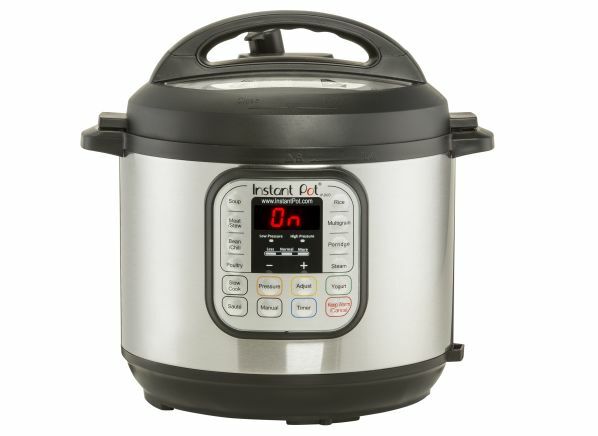 Compared with most of the other multi-cookers we tested, the Instant Pot Duo and Max needed more than 5 hours to make beef stew that was tender and ready to eat, and more than 7 hours to serve up chili with tender beans. Both models can slow cook, but you’ll have to give them more time than the competition. Both cookers turned out rice that was fluffy and moist. The Instant Pot Duo and the Max each cooked 1 cup of white rice in about 20 minutes, start to finish. But we found that both cookers left some rice stuck to the bottom of the pan. Neither model did a good job cooking our broccoli-and-carrot medley, earning only a Fair rating in our steaming tests, the lowest rating any pressure multi-cooker earned across our performance tests. The veggies turned out mushy and lacking in color. The Max required 12 minutes to reach pressure, and the Duo took 14 minutes. Even when we set the cook time to a minute or less, the veggies were overcooked. If you want to steam veggies, you're better off looking elsewhere in our multi-cooker ratings. The Duo and the Max both turned out nicely browned sliced onions. But keep in mind that none of the eight multi-cookers we tested match the sautéing power of a rangetop. They’re both easy to use, and their stainless pots proved durable in our tests. But the Max is slightly more convenient in that the control panel is less cluttered, and its touchpad includes venting options, making it a cinch to choose one of the three. The Duo does it differently and has a steam release valve on the back of the unit (depending on your recipe, you can set the valve to natural release or you have to switch it manually to quick release). Another bonus on the Max? It alerts you by flashing what stage it’s in—preheating, cooking, or keep warm. The Duo, on the other hand, uses a timer to keep you informed, so it's harder to determine where you are in the process. Both multi-cookers turn out smooth, delicious yogurt, but here’s why the Max earns its name. This cooker adds a sous vide feature, and we used it to cook chicken breasts, each sealed in a plastic bag and placed in a bath of heated water (it took about 45 minutes in our tests to bring the water to the proper temperature). Three hours later, the chicken was juicy and tender, and evenly cooked throughout. The Max also has a canning feature, which we did not test. Instant Pot says that recipes used must be tested by the Department of Agriculture for food safety. But the USDA’s recommendations have not been tested in electric pressure cookers. It’s crucial to do canning right; done improperly, canning carries the risk of botulism, a rare but potentially deadly form of food poisoning. Every time we tried to make chili using dried beans, the Max flashed a “Food Burn” error message as it was reaching pressure. That meant we had to stop, stir, close the lid, and let the cooker reach pressure again. After this happened repeatedly in the first model, we purchased a second model to test. The same thing happened. We didn’t get the “Food Burn” error message when we cooked beef stew with potatoes and carrots in the Max—or any other foods using the pressure cooker function. According to Instant Pot, the alert is a safety mechanism that stops heating to prevent food from burning, but the company says the warning can also occur when cooking very starchy foods that settle at the bottom of the pot. The Instant Pot Max is slightly faster and a bit easier to use, which helps to boost its Overall Score and earns it a spot on our list of recommended multi-cookers. But those factors—along with the option of cooking sous vide—might not warrant the $200 price tag for all home cooks. For half that price, the Instant Pot Duo60 7-in-1 delivers on most of its promises, including speedy cooking, and didn’t frustrate us with a “Food Burning” warning when we made chili. Its seven functions cover a wide variety of cooking, and the Duo's performance falls only slightly behind its more powerful cousin. In the end, the smart money is on the Duo.